For any of you who haven't checked over at my personal blog (Through a Glass, Darkly) lately, here's how Maggie is looking. 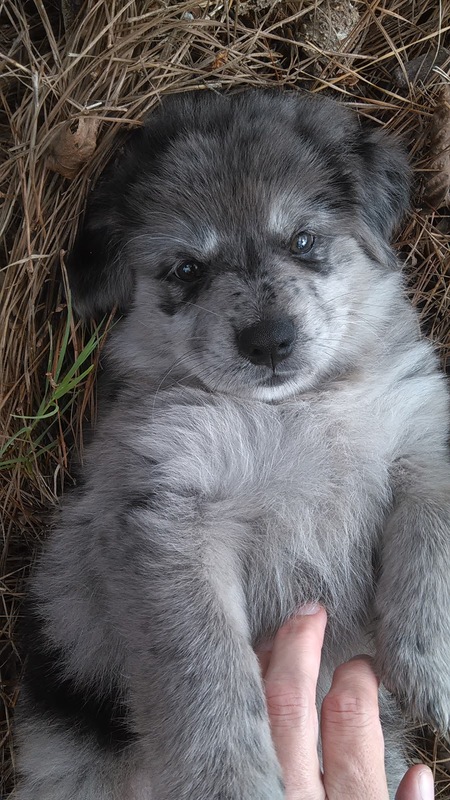 She's a happy, playful, fearless gal who loves to be outside above all things, and hates being in her crate. She cries. We try not to listen. 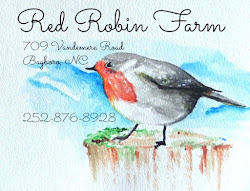 Red Robin Farm already has a presence each week at the Oriental Farmers' Market, although right now our sign reads "Red Robin Soaps," a business I've had for about five years now. On my market table today, among other things, I had some Purse Babies. 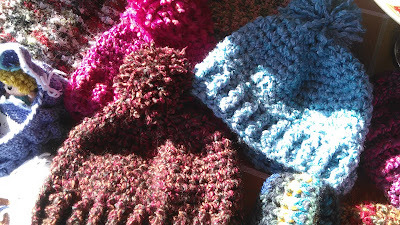 And some crocheted toboggan hats. But since it was 80 degrees, nobody was looking for a hat. 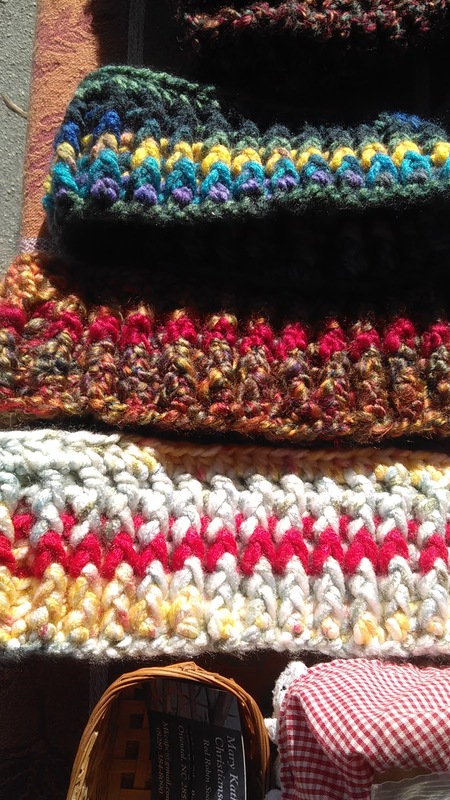 This is an easy-peasy pattern, so fast, and very adaptable to head size. 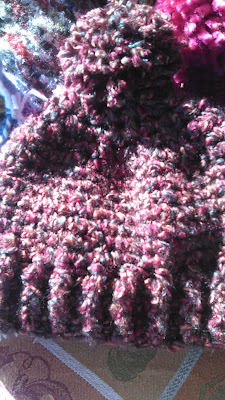 From that same hat pattern I adapted a head-band too, and these sell well in the winter. Today I handed out my very last business card from the batch Adam bought me a few years ago. It said "Red Robin Soaps." 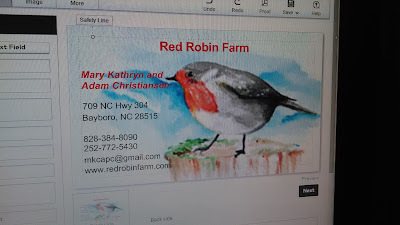 So it's time to get on the computer and design some new ones to buy, this time with our farm name. 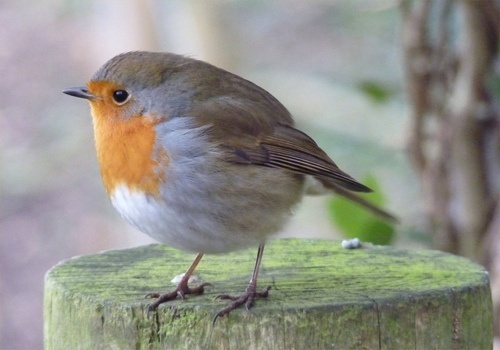 We're using Julia's red robin picture this time, of course! I also dropped by the local pottery store, Pigments of Imagination, to deliver some more lotion bars and talk about the new packaging. I think I decided on the burlap and twine. Adam filled in some of his trenches this morning, and we picked up pecans this afternoon. Phew! 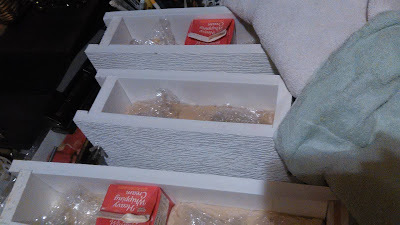 Then, I knew I had to make a new soap batch if I wanted to have any more soaps for Christmas sales. I was nearly out of lavender and tea tree, plus I wanted to make "Christmas Tree" and "Warm Cider" scents. So I made a batch of soap. It's resting now, getting into the gel stage under warming towels. 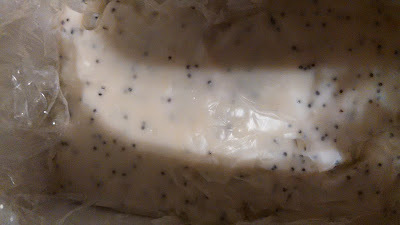 Here's some lemongrass poppyseed, a favorite. Adam's wheat and barley are looking quite nice. He needs to buy more pipe for his watering lines. Having even the smallest of farms involves lots of work and lots of waiting. 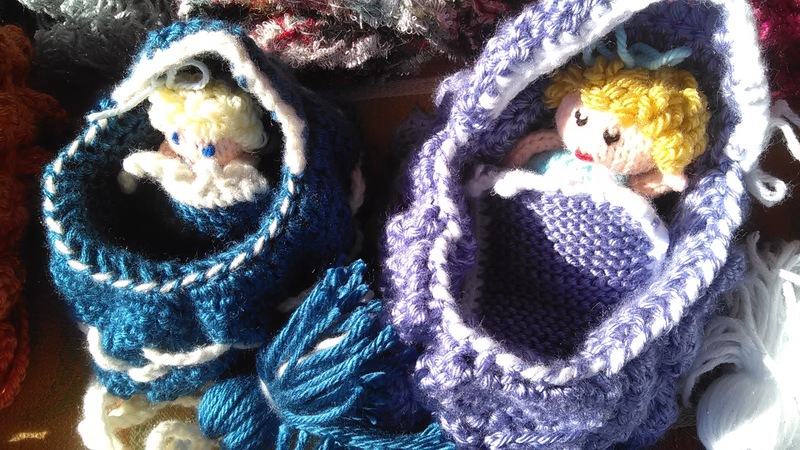 I think your purse babies are adorable! It is too hot to think about winter hats I agree. It's right around 3 p.m. and it's 86 and feels like it is 91. We need rain and keep having it predicted. We are very dry and what I don't hand water, or doesn't get hit by the sprinkler when I move the hose to various parts of the gardens is like dry straw. I have to pay for water so grass does NOT get watered. I like your new card template. Very nice. Your soaps I'm sure are a great hit and it's good to get some made now before the season. 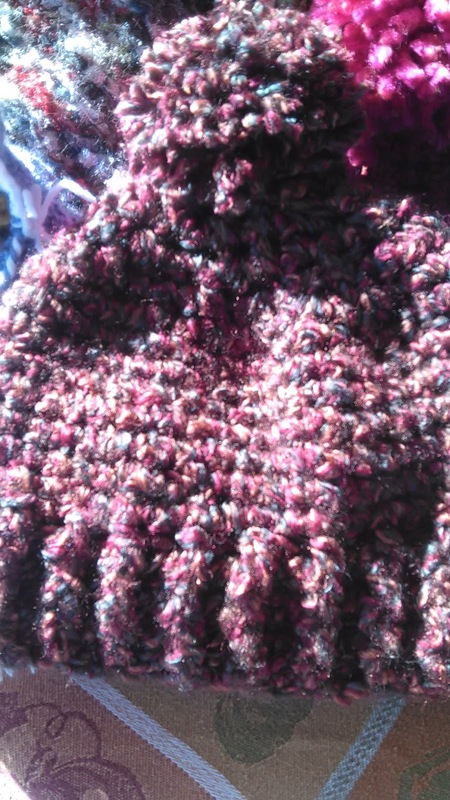 I like all your knitted things. The hats would sell where I live. It's getting colder and windier by the day. The soaps look wonderful and I like your new business card! Exciting adventures ahead!